We had such a great response to our "Friday BEFORE Black Friday SALE" that we decided to extend it throughout the weekend, until 11 PM PST on SUNDAY (today)!!! If you didn't get the opportunity to shop our sale on Friday, here is your second chance!!!! Details HERE..
Hi all! This is guest designer Alice. I have two cards to share with you today. I used the super cute Ice Skating Marci for my first card. Isn't she a cutie? I added Flower Soft to her hat and gloves for some fun texture. 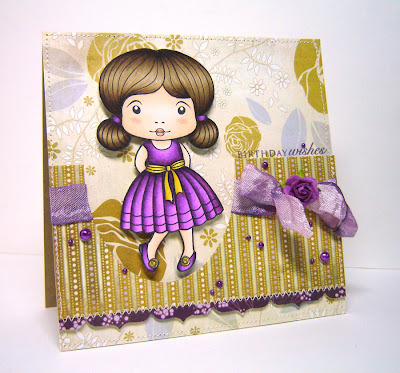 The patterned paper is from Cosmo Cricket's Mitten Weather collection and the sentiment is from Waltzingmouse Stamps. I used the beautiful Fancy Marci for my second card. She looks so elegant in her pretty dress! The patterned paper is from BasicGrey's Wisteria collection and the sentiment is from Papertrey Ink. Absolutely beautfil cards. I love the papers and layouts. Your coloring is outstanding. Gorgeousness on both cards Alice!! And your papers are so perfect for each Marci used. =) Thanks for sharing! These are both STUNNING Alice!! Love the papers you used, and the colors are gorgeous!! Great job!